Apollo has difficulty adjusting to his new role as a grounded service member in Command and Control. As the sectons since his rescue go by, Apollo has difficulty adjusting to his new role as a grounded service member in Command and Control, lashing out to his own regret at those closest to him. Adama tells Apollo that he expects him to be his successor as commander of the fleet and that he must buckle down and accept his responsibility. At the end of shift in C-&-C, the Cylon super-basestar suddenly appears, disgorging hundreds of Raiders. Apollo realizes the Cylons must have tracked the recovery mission that rescued him back to the fleet. He fears his rescue has doomed mankind. Battlestar Galactica: The Death of Apollo was a 6-issue mini-series published by Dynamite Entertainment. Muffit looks a bit larger on the main cover of this issue than he was in episodes of the TV series. On page 4, Apollo communicates with a ship of the fleet called Vantage Colonial. On page 5, he communicates with Kobol Goldstar. 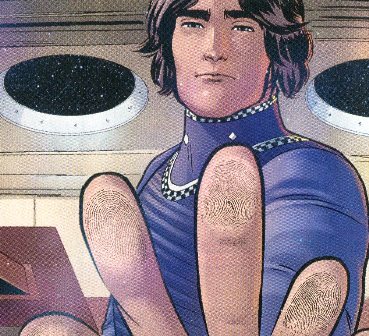 On page 13, panel 1, notice that Apollo's fingerprints are visible as he presses them against the viewport in his father's quarters. A clever touch by the artist. There is some dispute as to whether Colonial humans have fingerprints at all; in "Murder on the Rising Star", Boomer and Apollo appear to log into the personnel computer by voice and handprint, but the "Galactica Discovers Earth" Part 1 episode of Galactica 1980 states that the Colonials do not have fingerprints! On page 13, Commander Adama tells Apollo that he expects him to be his successor as commander of the fleet. 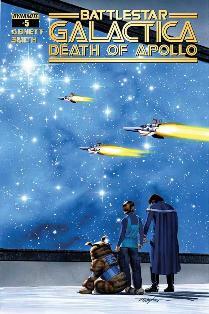 In "The Death of Apollo" Part 1, he had implied to Athena that she would be the one! Now that Apollo's permanently grounded due to his injury, I suppose Adama now thinks that this is the better course. On page 20, Athena orders the "tubo-lasers" to be cycled up; it should read "turbo-lasers". On page 21, the fleet reports the loss of a ship called the Centara in the Cylon attack. This leaves the fleet at 210 ships from the last-assumed 211 in "The Death of Apollo" Part 1.